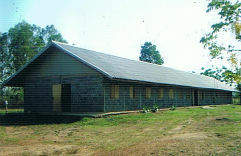 Num Nueng Children's Hostel was started by Takberg Church under the leadership of Pastor Ponchai Banchasawan so that Hmong tribal children on Takberg mountain could get an education that was not available in their home village. Pastor Ponchai has motivated Hmong leaders to build a hostel for their children opposite a school in Phechabun province, Northern Thailand. This hostel means these highly at-risk children have the chance of an education to break out of the poverty trap. Tribal children with no education are the ones most often trafficked into prostitution. There are now over 100 children in the hostel. They currently are cooking meals over an open fire as they do not have a kitchen at the hostel and the children are eating on a cement floor covered by plastic vinyl. They also play and study in this same area. This partnership involves a one-off amount to build a kitchen/dining room for the children. Good News Ministries was started in 1978 by two World Outreach missionaries from New Zealand, Lorraine Dierck and Valerie Bateup. Bright Hope World has been partnering with them since 2001 and it was Lorraine Dierck that first brought the needs of this children's home to our attention in late 2009. The direct beneficiaries are the cooks and the children at the home who will have much improved facilities to prepare the meals and will also have a much nicer environment in which to eat. Pastor Ponchai and the Hmong leaders have a real heart for these children and a desire to do all they can to give them an education and lift them out of the poverty stricken lifestyle they are currently trapped in. It is great to be able to partner with people like this who are doing all they can to help their community. Pastor Ponchai is a highly respected leader who as well as pastoring a church in Takberg has also been elected as the leader of the Hmong Christian community in Thailand. Before becoming the pastor of the Takberg church he was an intern at Muantong Church in Bangkok which is where Lorraine first met him. 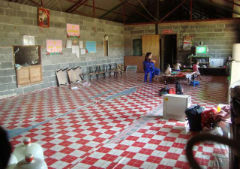 As well as setting up the children's home Pastor Ponchai also has a vision to build a mission centre and to plant churches in Hmong villages that don't have churches in Laos, Cambodia, China, Burma and Thailand. There is a committee of Hmong leaders that has been formed to oversee the running of the home. 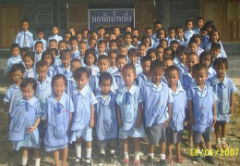 To build a kitchen and dining room for the Num Nueng Children's Hostel. This requires a one-off amount of US$10,000.